Plenty to do in Foxton and surrounding areas. This is a well presented safe community. Enjoy a family getaway or a private retreat. Boat ramp nearby, park area opposite, a good swimming beach with surf patrol, two local cafes, small supermarket, fuel station, dairy and award winning fish and chip shop on your door step. Room on the section for tents and there is access to a caravan power point. Well appointed in all areas. French doors and ranch slider for indoor / outdoor living. Separate dining, heat pump plus other electric heaters..
Linen supplied or bring your own if you don't want to wash and dry before leaving. Outside clothesline, drying lines in sleep-out foyer and airing rack also available. Property must be left in a clean and tidy condition. Great tenants. Would recommend as tenants . Great communication. Glad you enjoyed you're stay...welcome any time. We spent a very comfortable 5 days. We loved the proximity to the cafe (with great coffee), shops, estuary, and F & C shop. And the fire station for a bit of random entertainment. And it wasn't too far to walk to the beach, evening dining cafe & ice cream kiosk. We were only 2 so it was quite a pricey stay, given that in keeping with a Kiwi tradition I've not come across before all the housework, washing and bed-making has to be done by the guests (and all by 11am!) to a standard fit for the next guests. The people before us had not been too diligent and we were left with some rubbish, dirty washing and no toilet paper (which could have been awkward). On that theme I would have found the stay very much less comfortable with any more than one more adult, there being one bathroom and no separate toilet. There is an assumption you will travel by car (we used bus & taxi) and therefore be easily able to take you rubbish with you (and take your own linen). It pays to have someone tall in your party as the key holder is high up. I am 168cm tall and had to gather up some flat stones to be able to reach it. A nice comfortable kiwi bach that was good for our one night stop over, used our sleeping bags as wouldn't of had time to wash & dry sheets before we left in the morning. 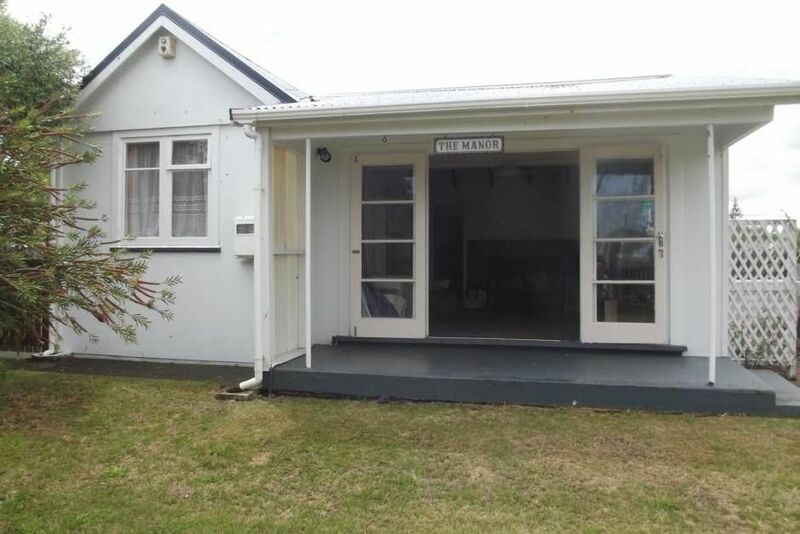 Good location close to the local fish n chip shop and stunning beach. The Manor is like a home away from home. It is very comfortable, in a quiet location, and has everything you need to have a relaxing holiday. It is clean and tidy and well looked after. Plenty of space to relax and in a great location.